Bruno Schroder who has died aged 86 was the senior member of the family which effectively owned the highly successful Schroders PLC, an international fund manager and investment bank with responsibility for overseeing assets worth £450 billion. With operations in about 30 countries and several thousand employees, it is a world-class asset manager on behalf of private and institutional investors including pension funds and also boasts a strong private banking arm. Mr Schroder, who was one of Britain’s wealthiest men with a family fortune estimated at over £5 billion, was a non-executive director for over 50 years and the longest serving board member of any company on London’s FTSE 100 Index. He was also proprietor of the 18,000 acre Dunlossit Estate, near Port Askaig in Islay, where as well as enjoying deer stalking he invested a lot of time and resources establishing it as a viable working estate, developing farming, forestry, quarrying, and renewable energy schemes among other initiatives. 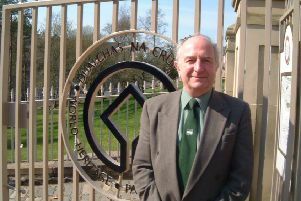 In 2001 he and other investors were responsible for “resuscitating” Bruichladdich as a working distillery after it had been mothballed for several years while he also played a significant and highly appreciated role in the island’s community life, supporting a wide range of activities, including helping fund a lifeboat. Heriot-Watt University awarded him the honorary degree of Doctorate of Letters in 2012 for “his contribution to Scottish whisky and other industries and to the preservation and development of the heritage, cultural life and economy of Scotland”. He was the great great grandson of Johan Heinrich Schroder from a prominent Lutheran merchant family who in 1802 came to London as a 17-year-old from Hamburg to work with an elder brother in a trading house before founding the firm of J Henry Schroder and Co in 1804. It acquired a reputation for dealing in bonds for international borrowers, subsequently becoming involved in investment business as it evolved into the financial colossus it became. 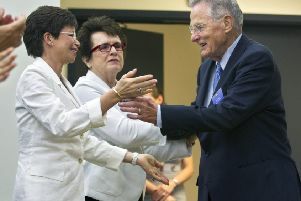 He joined the company in November 1960 after his father Helmut, who led it for many years, suffered health issues, initially working in the internal audit division, then in commercial banking before moving into the field of corporate finance, advising big companies on takeovers and acquisitions. On 1 January, 1963 he was appointed a non-executive director and continued in that capacity for the rest of his life. Later boardroom manoeuvrings diminished his direct influence on the company, with his role becoming more of a supervisory, ambassadorial one. Over many years he regularly attended his office on the seventh floor of the company’s then HQ in Gresham Street, London, diligently pursuing and promoting the company’s best interests. By 1999 Schroders were reportedly making annual profits in excess of £300 million and the following year the corporate financial side of the business was sold to Citibank group for £1.35 billion, a move said to have caused Mr Schroder “agony” given it had been such a prestigious and long-standing part of the operation. Bruno Lionel Schroder was born in London, where with his sister Charmaine he was brought up by parents Helmut and Margaret, the daughter of Colonel Sir Lionel Darell. He was initially educated at Cothill House Preparatory School in rural Oxfordshire before attending Eton. National service followed as Lieutenant in the Life Guards, the British Army’s senior regiment and part of the Household Cavalry, after which he went to University College, Oxford to study politics, philosophy and economics, graduating with an Honours degree. He then obtained an MBA at Harvard before briefly working in Hamburg prior to returning to London in 1960. In 1969 he married Patricia, known as “Piffa”, Holt, the daughter of an Irish soldier diplomat and in 1974 they had a daughter, Leonie. Piffa became a well known rifle shooter, winning trophies at Bisley and representing Ireland. The couple separated in the 1980s and later divorced. Mr Schroder later remarried to Baroness Suzanne von Malzahn. As youngsters in the early years of the Second World War he and his sister were evacuated to Dunlossit which had been purchased in 1937 by his father. His lifelong love affair with Islay began in imposing Dunlossit House which has panoramic views over the Sound of Islay. Piloting his own six-seater Pilatus 12 plane, he would regularly fly from London to Islay to spend time on the island, where he was popular with the locals who found him a likeable and unassuming individual, always ready to help with community activities. At the airport open day he provided free flights over the island on his plane. He and his sister contributed almost a million pounds for a new lifeboat, “Helmut Schroder II”, in honour of their father. The development of his estate provided employment and helped the island economy considerably. Slightly further afield in Oban he supported the Argyllshire Gathering and helped create a trust to promote bagpipe playing. He is survived by his wife and daughter.